Day Three , Colonel’s water on the Ifron. The day started slowly, I was determined to wait on my boots arriving if at all possible. So I took a stroll around Builth Wells to kill some time and found N J Guns, a shop advertising “Guns and Fishing Tackle”, a gloriously small, and totally cluttered place, smelling of gun oil and stacked to the ceiling with cartridges,shot guns and all manner of other bits and bobs. Such small outlets used to dot the British Isles when I was a boy, my first fly rod came from such a store, which operated as a pet shop, fishing tackle outlet and general store. Today such places are dying out, perhaps due to the efficiency of internet based shopping, and in part an apparent lack of interest amongst the youth for outdoor activities. Neil, the owner, was telling me that the local gun club had very few youngsters within its ranks and he no longer carried much by way if fly fishing gear, a small selection of flies and that’s about it. This in a town smack in the middle of trout, salmon and sea trout country. In fact it is quite remarkable that I have yet to see another angler other than one apparently receiving double handed casting lessons and not as best I could see actually fishing. 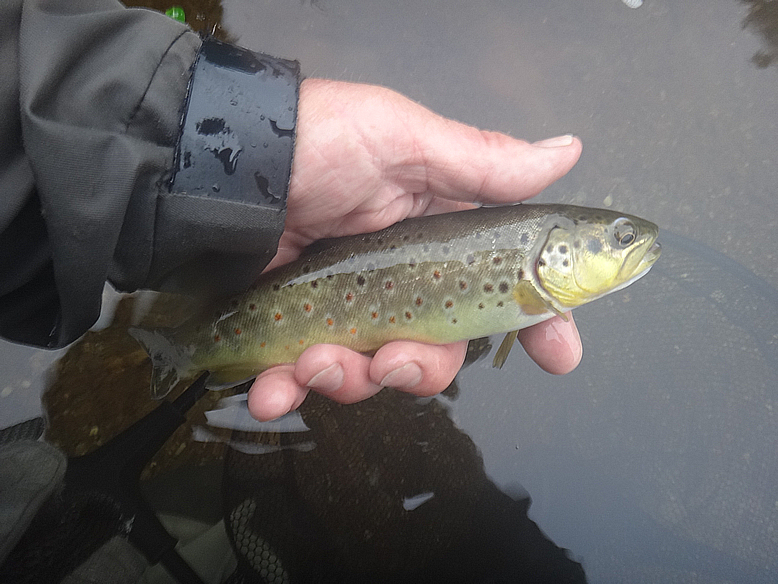 It seems remarkable to me, there is so much water easily available through the Wye/Usk fishing passport and I would have imagined the town to be packed with fly anglers. I purchased some dry fly floatant, a version I had never seen before, and reminiscent of “permafloat” which used to be sold in the UK when I was a boy. A glass bottle filled with a crystal clear, noxious smelling and possibly carcinogenic hydrocarbon one imagines as a solvent for a form of wax or similar. According to the instructions one simply dips the fly in the liquid and false casts to dry it out. As things turned out it worked pretty well. Then I returned to my base and tied some more perdigon nymphs, erroneously expecting to be Euro-Nymphing again later in the day and I sorted out my fishing gear in preparation for a visit to the upper Irfon River. What I was really doing was waiting to see if my boots would arrive. 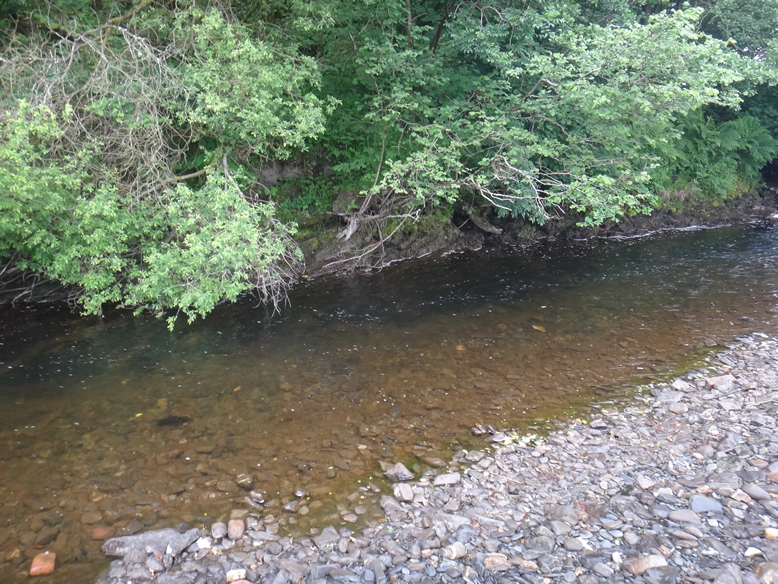 One crosses a section of the Irfon when leaving Builth Wells, so I stopped and had a look at it from the bridge. It my error to imagine that the upper section would look the same. turns out it was a lot smaller and with a lot less flow. 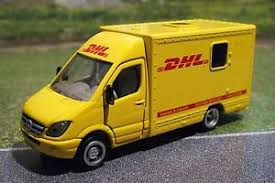 I was giving up hope that my boots might arrive on time, I had set my schedule at a 14.00 departure should the aforementioned footwear not arrive in time and just as I was about to head out in comes the DHL Van. Finally, footwear for the rivers, Hooray!!! Perhaps all that trouble distracted me, but somehow I mixed up Llandrindod Wells and Llanwrtyd Wells and headed out of town in completely the wrong direction; getting hopelessly lost in the process. (The Ordinance Survey map I have doesn’t even list most of the places I went through). Eventually I resorted to the phone and Google maps, which did take me the right way, but an hour long round trip to arrive at my destination. I think that the trouble is that all the names look the same; in fact you could name your own Welsh Village. All you need to do is put two ‘L’s” at the front, “Wells” at the end, and then randomly assign some consonants to fill the intervening space. Vowels are apparently forbidden in Welsh place names. Actually it strikes me that playing Scrabble in Wales would be most interesting, the locals would be getting a triple word scores even when they have run out of vowels. Trying to decipher place names is hard enough, doing so whilst passing a mini roundabout at 40 miles and hour is all but a blurred impossibility. It doesn’t help when the place you seek, Llanwrtyd Wells, is officially the smallest town in Britain. Just because your town is small doesn’t mean you can’t host a World Championship Event. Bog Snorkelling in Llanwrtyd Wells. Anyway, I saw a lot of nice countryside as my phone directed me through endless and nameless leafy lanes and finally arrived at my destination having driven a roundabout route along foggy roadways, I geared up to fish, taking the longer rod in anticipation of more Euro-Nymphing. 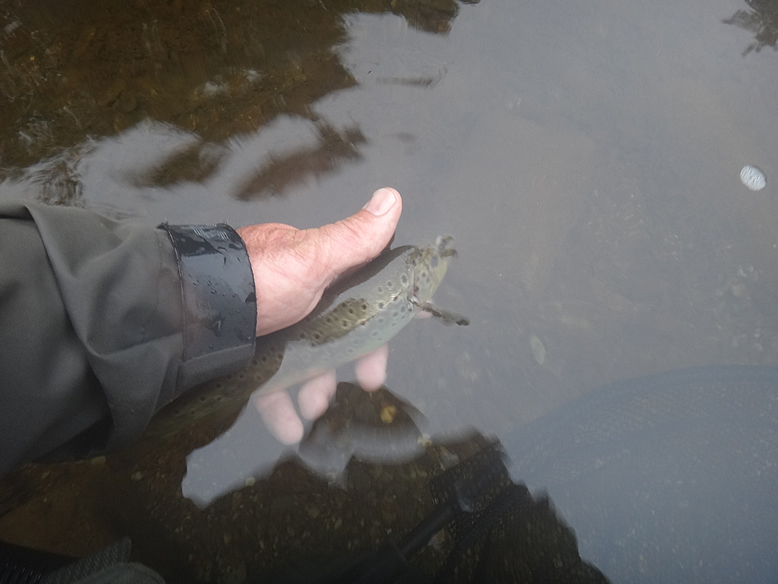 This is an upper section of the Irfon and was remarkably low, I probably should have brought the short rod, but I didn’t feel like walking back to the car. So I decided to forge ahead with the longer outfit and the low water. The prospects were not looking good with very little moving water and skinny flats over considerable parts of the beat. Things were not looking too positive but I did winkle a grayling out of the first run. I could immediately see the potential of the beat with a little more water in it, but here I was and had to make the most of it. I went in search of moving water, and found some tucked under the trees at the bottom end of the beat. Each cast into the shadowed flows a nerve wracking gamble , the flies landing inches from the vegetation. Toying with disaster I took a lovely grayling from the very first run, that buoyed my spirits, because looking at the water, things appeared to be pretty hopeless. The only real moving water was tight against the bank and under overhanging bushes making presentation a tricky business. In the end I really enjoyed the fishing, it was super tough and all the fish were taken with near impossible casts under the bushes, courting disaster with every flex of the rod. 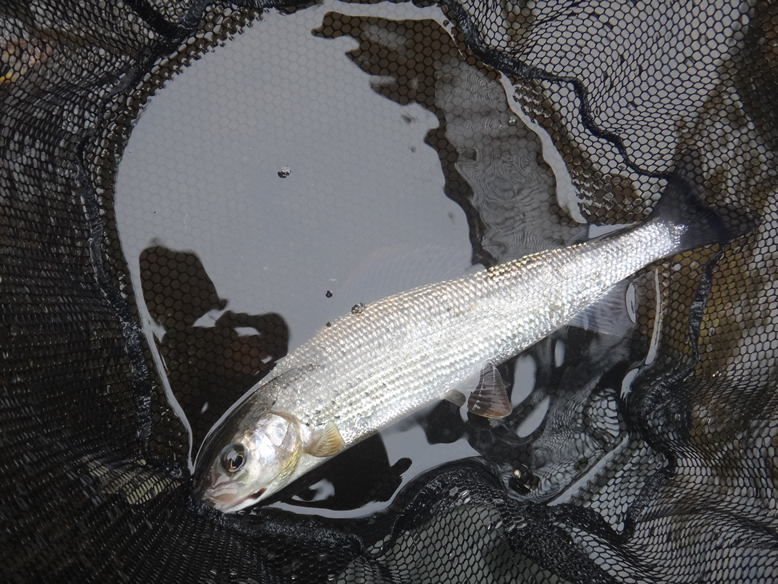 I took four really nice grayling on a tiny mayfly brassie and half a dozen trout, some of reasonable size. The browns all took the dry and the grayling all took the nymph. It was difficult and at the same time fun fishing. On the way back to Builth Wells and my accommodations I got lost again, this time in thick mist and went ten miles out of my way, but I figure in a new place getting lost is part of the adventure. There was plenty of petrol in the tank and no real time limits so what was there to worry about? As a finale ,when I got back to Pwllgwilym Cottages, Richard, the owner, was watering his plants. Bear in mind that it hasn’t stopped with the heavy mist for the whole day, I had to have a quiet laugh to myself. Richard tells me that “The mist isn’t enough for the plants”.. I suppose he should know,, but a month back people in Cape Town were having a shower with less water than Richard’s Bougainvillea got from the mist . This is farmland and unfortunately I interrupted junior’s milk break. For all that it is lovely here, I am well looked after by Richard and Jane at Pwllgwilym Cottages, there are miles of fishing waters within driving distance and , with the exception of the idiot ignoring a Give Way sign in his Alpha Romeo and accusing me of speeding, everyone has been helpful, gracious and polite. Tomorrow I am on another tributary and it may well prove to be as low and as tricky as today. Actually I don’t really care, I have caught enough fish, but the challenge is what drives me on. Of course, all the fish were released unharmed.